The focus of this study was on whether or not sargassum from the Sargasso Sea carries the invasive species Vibrio Cholerae, the etiologic agent of cholera, as it enters the Gulf Current Loop and passes through countries like Haiti and Dominican Republic. Following the huge cholera outbreak in Haiti in 2010, with current cases still being reported to this day, we would like to find out if it’s possible for the cholera strains to make it to our Gulf Coast shores. We participated in a reading journal group and read several articles about Vibrio Cholera. The articles each contained different important information about 2 species of Vibrio including Vibrio Cholera and Vibrio Vulnificus. We read information on a simple method for reliable identification of the species Vibrio Cholera. 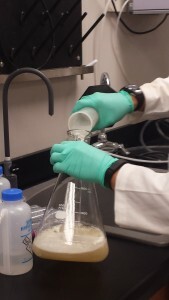 Information on the materials and methods that were similar to what we were going to do for the research, for the collection of the environmental isolates and identification of colonies of V. cholera using the isolation procedures. 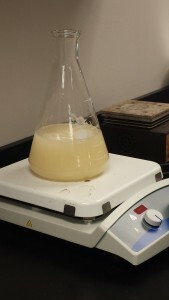 We made 1 liter of Alkaline Peptone water with a pH of 8.5, which is a media used for selective enrichment of V. cholera. We had to accurately measure 10 grams of 1% Peptone and 10 grams of 1% NaCl and mix properly with 1000 milliliters of water. We made a nutrient agar media which is also used for the identification of cholera. By adding 23 grams of Lemco agar and 800 milliliters of distilled water, into a 2 liter flask. We went on a field trip, to the beach, for collection of sargassum. We operated the YSI Sonde Water Quality Sampling and Monitoring Meter. The meter gave us the temperature of the water, the salinity, the pH level, the ODO%, as well as the milligrams per liter. We used a net for collecting sargassum. There wasn’t much sargassum in the water to collect on this trip, so we collected what we were able to get from the water, which was shoal grass. 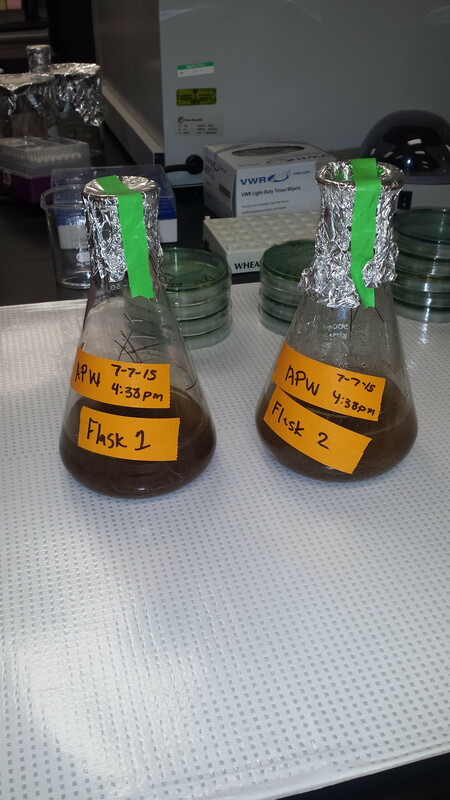 We placed the shoal grass into 2 flasks labeled APW and placed them in the in the incubator overnight. DNA extraction was completed and already prepared agar Petri dishes were spread platted using a serial dilution method using 4 quadrants for isolation and identification of the cholera species, based on distinction of yellow colonies. I learned that this research requires an understanding and knowledge of vibrio cholerae. I learned a great amount of information about the bacteria’s Vibrio Cholera and Vibrio Vulnificus. I learned information about what and how they are harmful to humans. V. Cholera is water born and causes intestinal problems and V. Vulnificus can be a very deadly pathogen that is food born with a 99% seafood mortality. I learned about using the mechanical Pasteur pipettes for measurements in micro units being that I had never worked with one before. 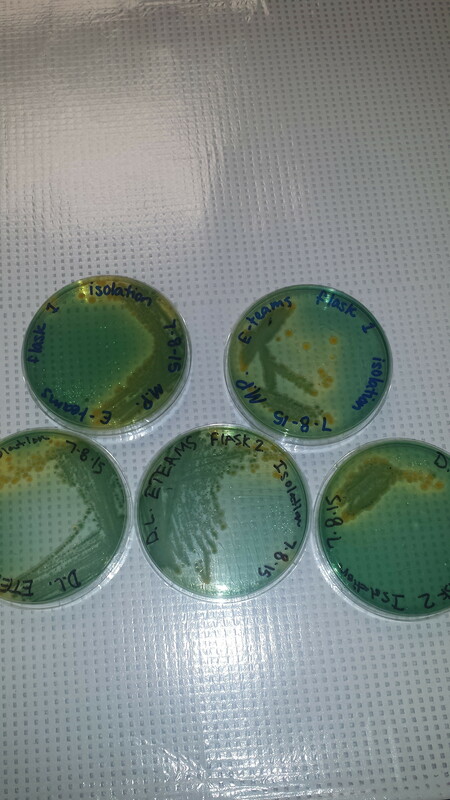 I learned about different types of culture media and the purpose of using them in bacterial identification methods. Was the hypothesis supported based on the end of the research? 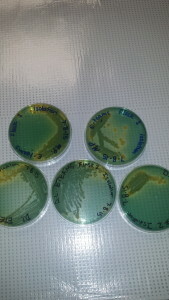 What was the green bacteria that appeared on the first set of isolation Petri dishes? I could connect this with a lesson on teaching students how math and science have connections, by presenting the importance of the use of exponents when it comes to working with dilutions in science. I could connect this with a lesson on distinguishing between mixtures and solutions and describing their properties. I could connect this with a lesson over elements from the periodic table including the combination of more than one element along with each of their symbols. I could connect this with a lesson on lab safety. Connecting this with a lesson about organisms and their environment, by connecting ideas about diseases and water the causes of a disease.